The U.S. Navy has decided to designate information about the status of the service's first unmanned warship as “classified” following initial tests of its first prototype, National Defense reported Monday. In November, ONR tested the prototype Sea Hunter ship outside Pearl Harbor, Hawaii. ONR tested the ship's endurance and range capabilities to establish “operator trust in safe reliable operations,” according to Lt. Cmdr. Tim Gorman, a spokesperson for U.S. Pacific Fleet. Following the demonstration, the unmanned anti-submarine warfare ship’s status was marked as classified, said ONR spokesman Bob Freeman. The Navy received authority of the Sea Hunter in January of last year after the Defense Advanced Research Projects Agency transferred the prototype ship to the service branch’s Office of Naval Research to continue development. 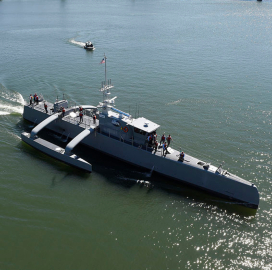 DARPA built the ship under its Anti-Submarine Warfare Continuous Trail Unmanned Vessel program, which was renamed as Medium Displacement Unmanned Surface Vehicle under ONR.